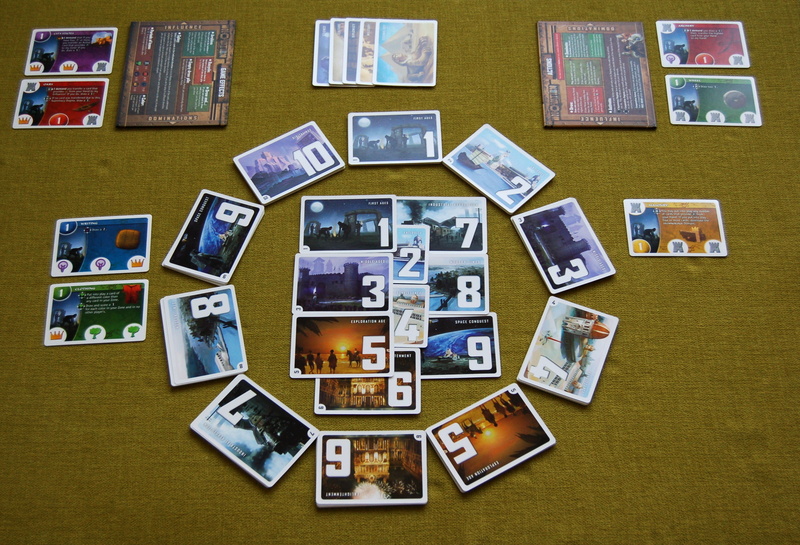 The card game which could be called „Discoveries and inventions“, „Civilization“ or „Progress of humanity“. It pleasantly surprised by the good gameplay and variability during each round. Downside was the only instructions booklet that lacks a description of the main story line of the game and between the lines, you must also search its goal. This article makes it easier to start in the first game and adds, what the instructions are missing. In the first place: objective of the game. The aim is to beat the opponent, even if the game contains significant cooperative element and cooperation is beneficial for both parties. 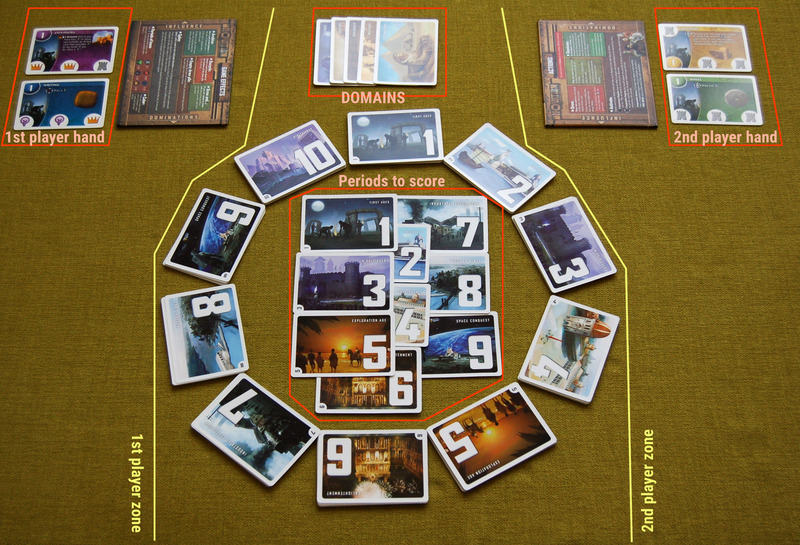 Most often it will take to victory controlling of a sufficient number of Periods and Domains. Taking control of the Period you can achieve through enough of the Influence. 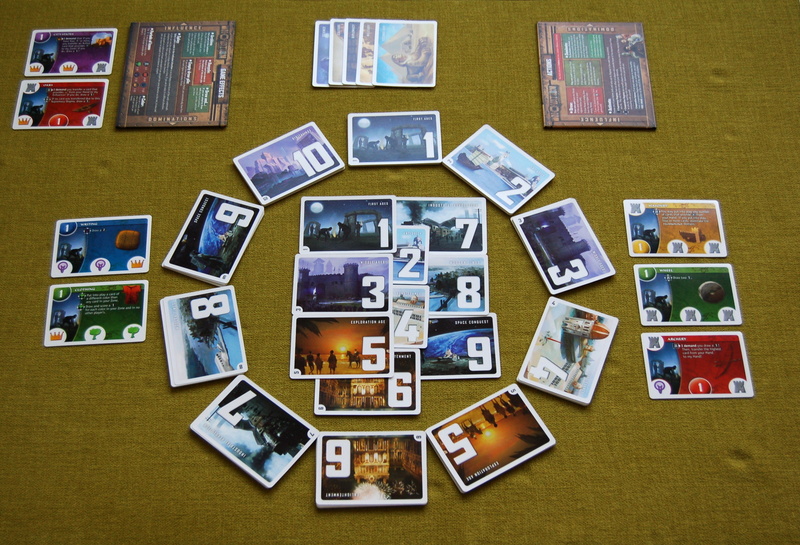 In the speech of the cards it means: you are the winner once you have in the Dominations section of the player’s zone at least 4–6 cards (according to the number of players). Cards of Periods you receive the through the Influence. 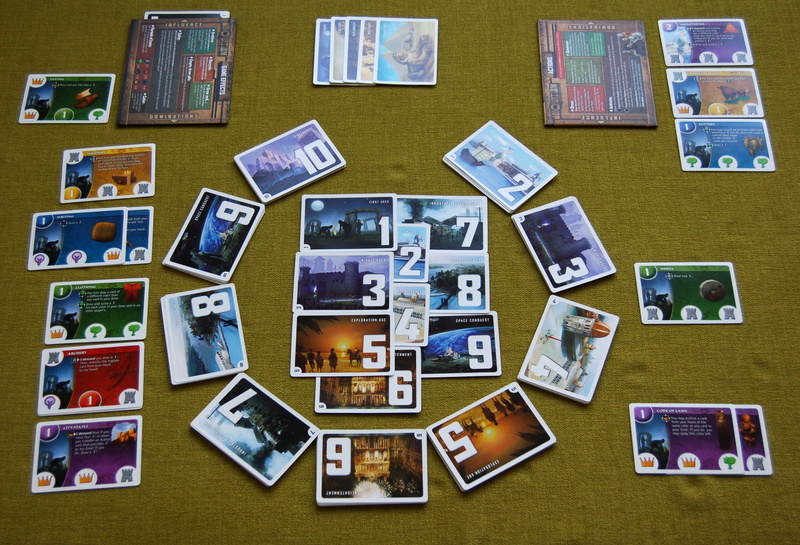 In the Influence part of player’s area you may add cards only through effect of the other cards. Domains cards you obtain in a special way, which is described on the card. We're starting to play. We have the initial layout of the game for two players and we understand the basic principles of the game. The cards in the hands of players are exposed just for illustration; players cannot see each other hand. The game begins. The first player (on the left) plays the Writing , the second player (on the right) played the Masonry. In alphabetical order is M before W, therefore starts the second player. 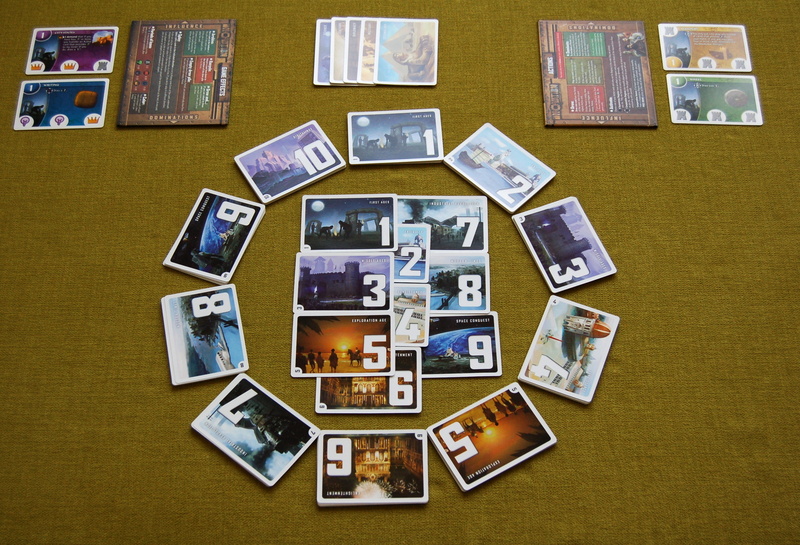 The second player decided to draw a card in your hand. He has now the Archery. It is first player turn. He took advantage of the effect of the card Writing – draw two cards. 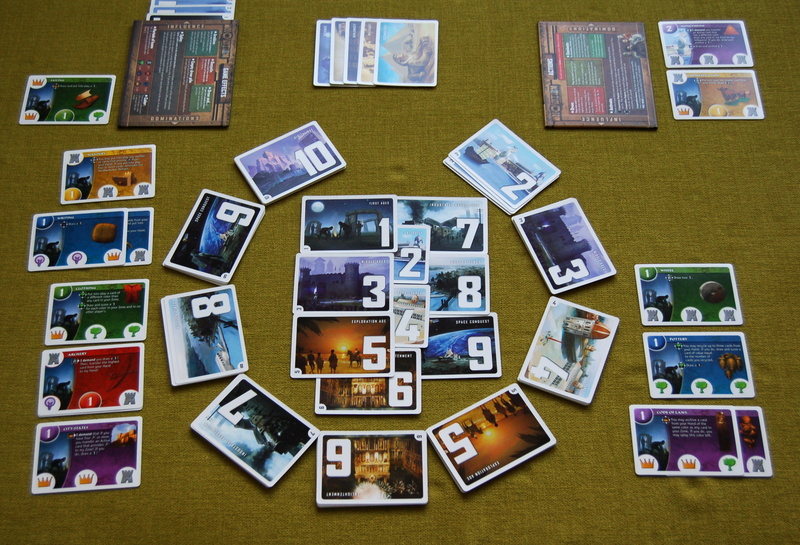 The symbol on the card next to its effect means that it is shared with the second player assuming that second player has in play at least the same number of cards with illustrated symbols, in this case, the light bulbs. The second player does not have any light bulb (on played yellow card he has three castles), so the two cards draws only the player on the left. He has got in the hand the (Oars) and the (Clothing). The second action of the first player is the playing of the green card of Clothing . His move ends. The second player makes use of the effect of yellow Masonry – he can play from the hand all the cards with the symbol of the Castle. If the first player had played at least three Castles (as well as the second player), he could take advantage of the effect too, but this time is without the benefits. The second player plays the green card Wheel and red Archery. The second action of the second player is draw two cards thanks to the effect of the card Wheel (he gets purple Code of laws – and yellow Domestication. It is the first player's turn and he uses the first effect of the card Clothing. The shared effect is denied to the second player (he would need at least two trees). The first player plays at the same time two cards in a different colors than he has yet played – red Oars and violet City States. The second turn of the first player: he scores the first card and put it in the Influence section as the second effect of the card Clothing (he draws the card of the first Period and inserted it next to your game card). It is second player's turn and he plays the purple Code of laws . The second player draws in the second step one card in your hand – purple Mysticism. 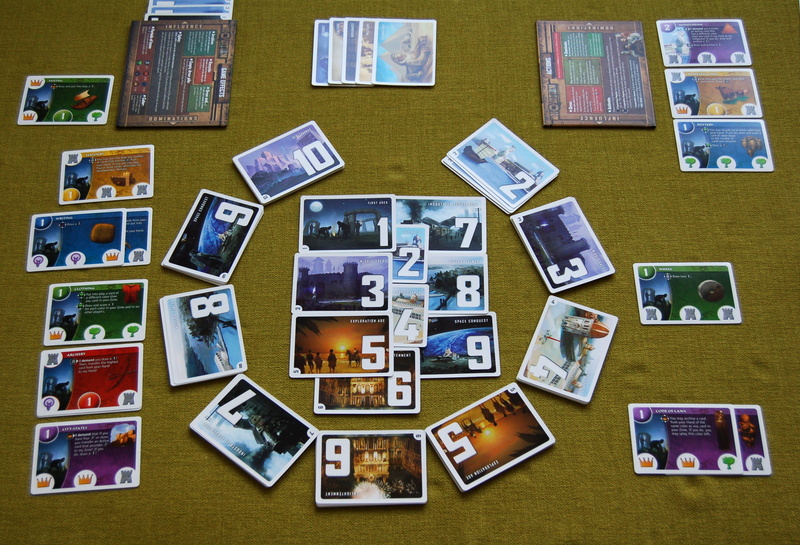 It is first player’s turn: he decides use the command effect of the card City States. The command is executed, because the first player has more played crowns (4 : 2). It is right the second player to decide which card he will give up. He opted for the red Archery, and it gets the first player. The card overlaps the Oars. Because of that the effects of the Oars are for the next rounds unavailable (which may be changed through the effects of the other cards). The chosen effect of the card Oars has an impact on the second player. He draws the blue card Pottery. The card Writing allows to the first player to draw two cards (blue Tools and green Sailing). The second player uses the effect of violet Code of laws – slips under of purple card the purple Mysticism and at the same time splays the pile to the left, as states description of the effect of the card. 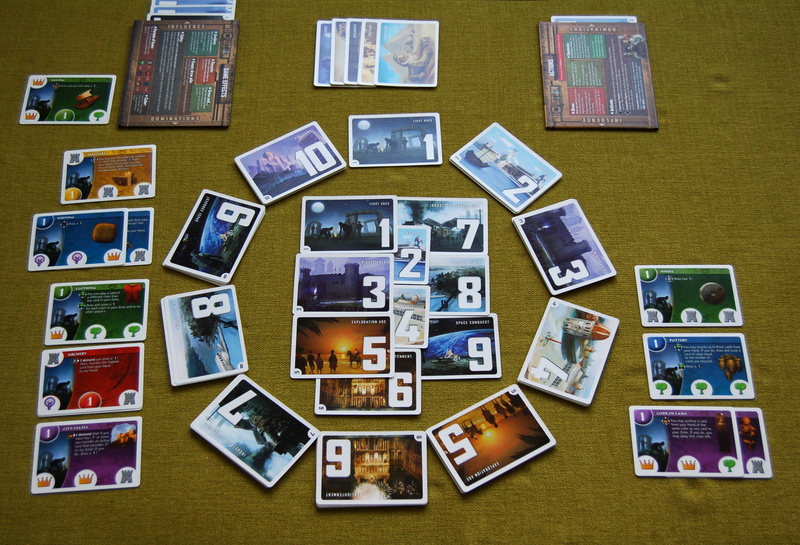 The advantage of splaying is obvious – in the game is getting more symbols. The same advantage has the first player too as he has in play four crowns (4 > 2). Blue Tools slips under and the blue pile splays left. The first player repeatedly uses the City States – the second player hands over yellow Masonry and he draws a card. Thera are no cards of the first Period, so he draws from the second Period purple Monotheism. The first player uses Clothing again (two trees against one tree; the second player can not use the effect of the card) – draw and score the card of the first Period for each color the second player is missing – this means four points into the Influence, because cards of the first Period ran out, he draws from the second Period. 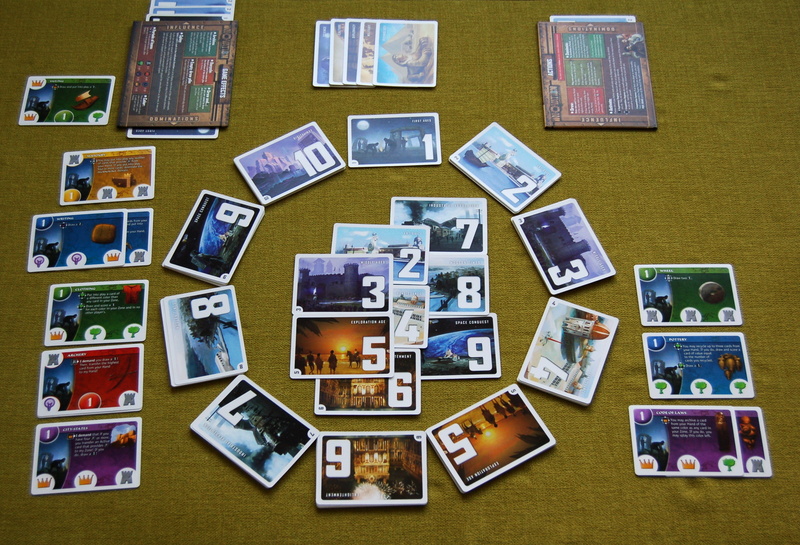 The second player plays the blue card Pottery. Thanks to the Pottery he has the advantage of more trees and uses first effect of the card: he recycles two cards of the Period and he may draw and give to your Influence a card its value equals to the number of cards returned, i. e. to the Influence he gets two points. The first player then uses its five points in the Influence and dominates the first Period.